Upper Deck Entertainment (UDE) reveals new foil extended art promo cards for the Marvel & DC Comics TCGs. The first promo cards - Children of the Atom and The New Brotherhood - will be given out on Saturday, June 26 at Origins in Columbus, OH. Be sure to ask your local hobby store about UDE's new Hobby League where you can earn and win new promo cards. More cards are to be revealed each month. There will also be promo cards created for the following events - Pro Circuit Qualifiers and National Championships - as well as player and judge rewards. 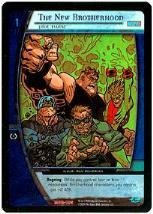 For more information on the Marvel & DC Comics TCGs, visit www.ude.com.